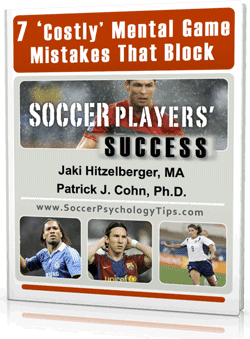 You are here: Home / Soccer Psychology Tips and Strategies / Soccer Psychology Articles / Can You Improve Confidence Without More Training? Can You Improve Confidence Without More Training? More training or improved practice can lead to more confidence, but this may not be the only way to improve it. Can You Improve Your Confidence Without More Training? The good news is that you can improve your confidence without more practice or training harder. Improving your mental game can lead to greater confidence and help free you to play more aggressively without the fear of making mistakes. If you commit to developing your confidence like you work on your physical skills, you can play at a higher level and perform with less worry or tension. Remember when you first started playing soccer? How were your technical skills (controlling the ball, passing, headers)? Did you perform as proficiently as today? NO! You developed these skills through focused repetition in practice with the help of your coaches. 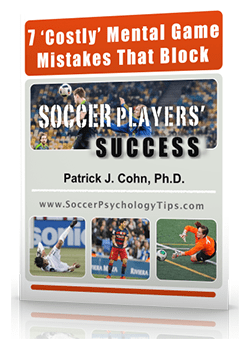 It is interesting that soccer players would never rely on chance or luck to develop their technical skills, but often do nothing specific to develop the skill of confidence. Well, confidence, just like physical skills, is a skill that can be developed with focused repetition and discipline. In fact, many athletes and teams seek a Mental Training Coach to assist in the development of confidence as well as other mental skills. What can you do to be more proactive (instead of reactive) with your level of confidence? In other words, how can you start competition with a full tank of confidence instead of waiting for it to come from good play? What things can hurt or destroy your confidence? You have to address what sabotages your confidence too. You do this by managing your personal confidence-killers, such as doubt, negative self-talk, self-criticism, and high expectations, just to mention a few. Being more proactive with confidence and managing the confidence-killers will help you stabilize and grow your confidence beyond your training program. Confidence is not just a byproduct of training and performing well. Confidence also flows from focusing on your strengths and talents, being mentally prepared for competition, and managing the confidence-killers. 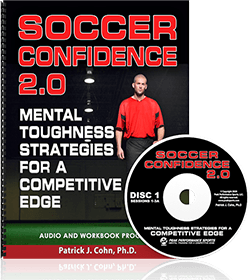 Improve your confidence in soccer today with our Soccer Confidence Workbook and CD Program!